OK, it’s very rare that I get super pumped about something as simple as credit card processing, but this one is a game changer in a lot of ways. Starting this week, Parent Groups who are currently Premium Plus Credit Card Members (or those that upgrade!) will now have the ability to accept fully integrated credit card payments without the need of a merchant account or third party bank with a new service called Stripe. Essentially what this means is signing up to accept credit cards is now even easier than signing up for a paypal account. I just tested it out for myself. It took me about 4 minutes to get my account created and 90 of those seconds was spent digging around for my checkbook since I use it so rarely. The rates are decent at first glance, but considering that there are NO additional monthly fee’s at all, these rates are downright dreamy. Here’s how it works. Our Premium Plus Members have access to our advanced form partners at Wufoo. 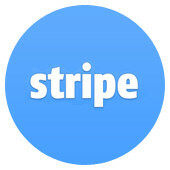 Wufoo integrates seamlessly with Stripe to add payments to any form you create. If you don’t have an account yet, we’ll even help get you signed up without having to start all over and reload the page. The fee’s are extremely simple. They charge 2.9% of every transaction as well as a small $0.30 transaction fee. There are no other fees! No monthly fee, no settlement fee, no auth.net fee, no amex extra fees, etc. 2.9% + $0.30 – Period. You may notice that the actual transaction fee percentage (2.9%) is higher than our other traditional credit card processing option with Capital Merchant Solutions (1.99%), so why is this something to get excited about? Here’s why – – with no monthly fee, this is an incredibly low rate for parent groups that are charging less than $20,000 in credit cards per year on their website. For example, if your group charges $20,000 on your website, your group would pay around $700 in fee’s using either method, but as you start to increase upwards from $20,000 it does become cheaper to switch to Capital Merchant Solutions. For Parent Groups collecting less than $20,000 in credit card transactions per year online, this new Stripe payment system is the best way to go. Especially for groups who do not anticipate a whole lot of sales online, but want to make the option available. No annual fee’s means you don’t have to pay anything for the ability to collect credit cards until you make a sale. It’s a win-win all around. Convinced? Want to give it a try? It’s really easy. All you need to do is upgrade your groups Digital PTO website to a Premium Plus Credit Card Plan and this new Stripe payment system will be ready and waiting for you to start raising money! Learn more about Accepting Credit Cards here. Already a Premium Plus Credit Card Plan Member? Here are instructions on how to add Stripe! We’re really excited about this new payment option and we hope that it will be beneficial for all of our Parent Groups, large and small.